Pros: The results are longer lasting than any other hair removal method and a lot less painful. Great results! Cons: It's corded so isnt as easy to use as an epilator and its not as accurate on boney areas. A lot of people are now leaning towards the use of IPL treatments at the comfort of their home. Aside from that they are cheaper than professionally rendered IPL treatments, you also get more control in the results you want. One of your best and most effective choices when it comes to this hair removal method is the Braun Sil-expert IPL BD5009. It can give a fast and permanent result without the pain you can expect from epilating or shaving. In case you’re hard pressed in finding a good IPL device, here’s a thorough review of the product. 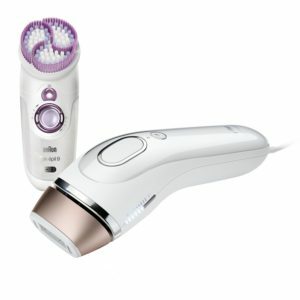 The Braun Silk-expert IPL BD5009 isn’t as bulky as other IPL devices. Since it’s sleek in design, you don’t have to worry about where to store it right after use. It’s shape and size look similar to a remote control. However, although sleek, the device comes corded for maximum power. This can affect its ease of use but makes up for an uninterrupted power supply. You won’t have to stop treatment just to recharge its battery. This IPL device isn’t only safe to use at home; it can also give quick results. You can treat your legs in just under 8 minutes and you can expect to have your unwanted hair permanently removed within 4 weeks. It also has a gliding technology to help you cover more areas easily. There’s a contact sensor as well for a more precise result. Your skin tone plays a crucial role in the results you’ll get from an IPL treatment. If your target area is dark, it means that it has more melanin. If this is the case, your IPL device needs to increase its energy intensity to effectively remove hair from the area. This is where the Braun Silk-expert IPL BD5009 stands out. The SensoAdapt Technology in this device makes it great for determining and automatically adjusting to your skin tone. It constantly reads the level of your skin’s melanin 80 times per second. This eliminates the need to use complex charts just to adjust the intensity of your IPL device. This IPL device does sting a bit, but it isn’t too uncomfortable. In fact, a lot of its users claim the pricking sensation as practically bearable. You have to keep in mind, however, that it can be more painful to use in the sensitive parts of your body or where you have thicker and darker hair, such as your bikini line. If you experience this type of discomfort, you can take a break and resume once you’re comfortable again. Waxing and epilating pull out your hair from the roots. IPL, on the other hand, works to get rid of your unwanted hair by killing your hair roots, so that it won’t allow hair regrowth anymore. The more you use the device, the more permanent the results are. However, although it targets the hair from underneath the surface, you still have to prepare your skin before using the device. Make sure to shave or just trim the area. You don’t need to apply any gels or creams prior to its use. IPL devices work by emitting pulse lights. This Braun Silk-expert IPL BD5009 has about 120,000 flashes, which translates to 6 years of full body treatments or 14 years if you’re going to use it on the smaller areas of your body. Technically, you’ll have enough flashes to treat yourself or even your friends and family. A lot of its consumers are actually in love with Braun Sil-expert IPL BD5009. The fact that it doesn’t cause too much pain and discomfort is already a plus factor for this IPL device. Another great thing about the device is that it’s compact and easy to store.Although it comes with a cord, most of its users aren’t bothered about it since it provides uninterrupted power supply. Braun Sil-expert IPL BD5009 doesn’t come cheap. However, with the permanent result and pain-free experience it can give, the device is surely worthy of giving a shot. Plus, the number of flashes you can get from it makes it a great investment, too. If you have the extra money and you’re looking for a reliable hair removal tool, it’s a good idea to include this product in your list.